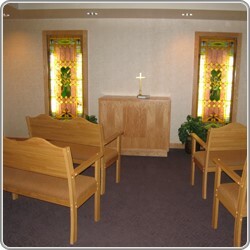 The Sidney Health Center Chapel is conveniently located near the admissions area. The Chapel is open twenty-four hours a day for patient and visitors’ needs. A prayer book is located in the Chapel for those who would like to request a prayer. In the often stressful and demanding healthcare environment, the Chaplain is an understanding friend and confidant. The Chaplain can provide a listening ear and a pastoral point of view for the staff as they face professional and personal problems. Staff members who have no minister of their own often seek the Chaplain's counsel, especially during times of personal family need or professional pressures. Usually the healthcare Chaplain sees a patient/resident before his or her minister is aware of the hospitalization. With the patient/resident's permission, the Chaplain can call the family pastor, priest, rabbi, or other religious leader. The Chaplain provides pastoral care and support until the patient/resident's own minister arrives. The Chaplain is available to help with the distressed families of critically ill or dying patients/residents. If the patient/resident does not have his or her own minister, the Chaplain serves as trusted friend and pastoral support. Serving often as the healthcare facility's religious community public relations person, the Chaplain is able to coordinate services provided by the clergy. The Chaplain is prepared to conduct seminars and workshops on topics such as patient/resident visitation, terminal illness, death and dying, and the grieving process.